Dream But Don\'t Sleep below. BUT before you do... we got a special offering to celebrate DJ Roli Rho\'s bday. Instead of getting gifts, he\'s putting one out for y\'all to cop. Back in 2001, DJ Roli Rho released his first break record with tabletools, the label put together by TableTurns back in the day. Previously it was only available on Vinyl. Roli recently unearthed the original wav files, remastered them and has put together a DOWNLOAD PACK for your scratching and beat juggling pleasure. A measley 16 bucks for the digital DL. Available immediately after purchase. 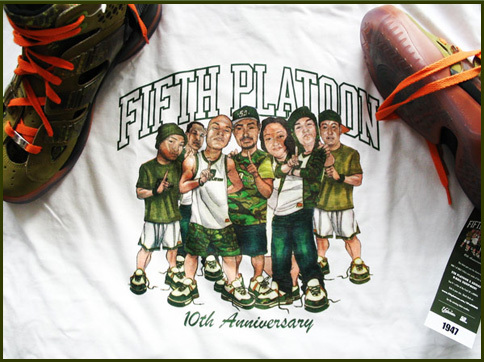 ALSO - IF you order now - You can also pick up a now very very VERY limited edition 5th Platoon Anniversary T-shirt. THESE are the LAST batch of shirts in existence - so this is a WHILE SUPPLIES LAST SITUATION. I would suggest if you want one, you gotta act not now... but RIGHT NOW. *NOTE* - when the T-shirts run out (or if you really don\'t want one cause your a weirdo) , pick \"Just the digital DL\" from the \"Color\" drop down list. Roli Rho Adobe Breaks Digital Re-Release (5th Platoon Anniversary T-shirt Combo) <b><a href="https://www.instagram.com/djrolirho/">DJ Roli Rho&apos;s </a></b> 1 break record, originally released back in <b>2001</b> on vinyl only. Recently Roli unearthed the original Wav files. Here it is <b>re-released as a digital download for the very first time</b>. <br> Act now, and get a <b>5th Platoon anniversary T-shirt </b> Illustrated by the folks at <a href="http://www.undrcrwn.com">Undercrwn</a> FOR FREE (WHILE SUPPLIES LAST)<br> Limited Sizing available ,L,XL, 2XL in orange and white (if it&apos;s not listed, that means that size and color were sold out - snooze ya lose! )<br> When the shirts run out (or if you really don't want a T-shirt for FREE cause you are a weirdo) , just choose "just the digital DL" from the dropdown menu. DJ Roli Rho&apos;s 1 break record, originally released back in 2001 on vinyl only. Recently Roli unearthed the original Wav files. Here it is re-released as a digital download for the very first time. When the shirts run out (or if you really don't want a T-shirt for FREE cause you are a weirdo) , just choose "just the digital DL" from the dropdown menu. A few weeks ago, we had an impromptu 5th platoon reunion . The original 6 members of the 5th Platoon hadn't been in the same room together in 20 years. For one night only, we came together for one last (???) basement session. You can peep the recap by Dream But Don't Sleep below. BUT before you do... we got a special offering to celebrate DJ Roli Rho's bday. Instead of getting gifts, he's putting one out for y'all to cop. *NOTE* - when the T-shirts run out (or if you really don't want one cause your a weirdo) , pick "Just the digital DL" from the "Color" drop down list. The DNA of the Blueprint - Created as a tribute to Blueprint Trilogy, this mixtape follows the concept on my "originals" series, weaving back and forth between the Hip Hop songs from all the Blueprint albums, and the music that was used to create the songs - the DNA of the Blueprint. Originally presented as a FREE Download in March of 2010. It's still a great listen, especially since the Blueprint albums are no long available on spotify / apple music. TO DL for Free Please get the COUPON CODE to Apply at Checkout. Scroll down to the Description area below to get the CODE. DJ Neil Armstrong's latest mixtape SidePiece Valentine's. Originally slated to drop Feb 15th, but I'm one of those dudes who will be late to my own funeral. No worries though, everyday besides Feb 14th is SidePiece Valentine's Day. Sidepiece Valentine’s, songs that cover the not so pretty side of your search for love and booty. See below for the liner note description. With every order you will also get automatic Digital DL of the mixtape to tie you over while USPS does the shipping thing. 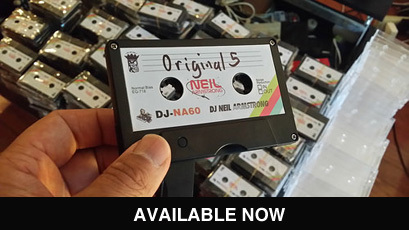 **PLEASE NOTE : This item is fullfilled by yours truly DJ Neil Armstrong . At times I am off on tour and will not always be able to send the physical Cassette immediately. PLease email me at [email protected] for approximate Send out date for Item. Pre-Order the latest mixtape Still Nonstop.